I was recently filling out a form that asked for my current marathon personal record. I realized I have no idea what mine is. It’s been years since I’ve done a marathon that isn’t either: 1) a crazy hilly trail marathon (while races with lots of single track and 5000+ feet of climbing are a ton of fun, they aren’t a fair measure of what I’m capable of time-wise) or 2) a marathon that I was pacing. This realization got me thinking about why I enjoying pacing races. Pacing means I’ll be running a pace I know I can do fairly comfortably. It’s not physically challenging the way running a race full-out is. However, it is challenging in an entirely different way: I feel so much more pre-race anxiety when pacing. 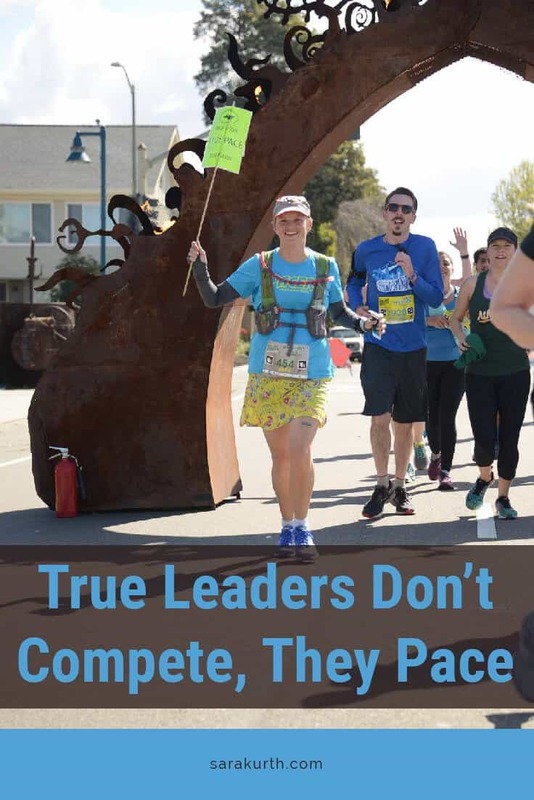 Pacing a race is a big responsibility – the race isn’t just about me and my goal. If something goes wrong and I don’t reach my goal time, I’d be disappointing others. That would feel sooooo much worse than just falling short of my own goal. Most runners arrive on race day to chase their own goals. Win the race, PR, win their age group, or whatever else their goal may be. Pacers, on the other hand, have a much different goal on race day- run at a specific pace. And usually at a pace slower than they are capable of. All to help others on race day. Pacing requires attentiveness, responsibility, selflessness, commitment, focus and restraint. Being a true leader means letting everyone shine in a role where they will excel. In a way that will highlight their skill set. For me, I often say I’m not fast, but I am consistent. I’ll leave the fast times to the speedsters. I shine at keeping my pace and effort consistent and encouraging newer runners. Pacing slower times and new runners on race day is the perfect use for my skill set. Leaders need to sacrifice their personal goals to help the group achieve a common goal. I don’t pace a 5-hour marathon because that is my goal. I pace a 5-hour marathon because other runners have that goal and need help to make it happen. But I’ve never thought about it as if I’m taking a back seat. I am enabling others. I feel great pride in helping others accomplish their race day goals. One of my biggest race pet peeves when I run as a civilian (a/k/a not a pacer) is when I see pacers who don’t take the role seriously. When they are clearly running their own race, running way too fast because their assigned pace is slower than they want to run that day, or when their pace is all over the map. As pacers, we may not always hit our assigned time (we are only human and have bad races too), but we should always do our best. And our ‘best’ on race day has nothing to do with our personal goals or our personal best times, it’s all about the goal for the group. When I pace my running club, I run with the same people week after week. I really get to know them and what inspires and motivates them. On race day, I’m usually running with strangers. I need to help others face and overcome challenges on race day and learn quickly how to best inspire or encourage people I just met. Some want inspiration, some want relatability. Some want humor, some want heartfelt sincerity. In short, some want a carrot, some want a stick. Getting better at quickly adapting to the requirements of others is a great skill for all leaders to develop. Sure, the primary goal when pacing a race is finishing at your assigned time. But that is only one piece of the puzzle. We need to check in with our runners along the way. Give pep talks and advice. Provide feedback on how it’s going. It’s about the journey and the destination. When I run as a 5-hour marathon pacer, my pace is 11:26 minutes per mile. For me, and even for many of my pacees, this pace feels slow, especially in the first few miles. Without fail, I’ll respond: just wait, it won’t feel so slow 4 hours from now. I also have to practice discipline when I’m nearing the end of the race and I’m ready to be done already. I’ll want to speed up, but that isn’t in the best interests of the group. I need to remain disciplined. Practicing discipline can only be a good thing. I’ve run many, many miles and finished many races. I’ve done some things well, and I’ve done some things poorly. Pacing gives me the chance to use my own lessons learned to help others. As a pacer, my job is more than just to pace. It is to set a good example. To fuel well, to hydrate well. To check in with my running form and keep my mindset in check when I’m bored and grumpy and just want the stupid run to be done already. All to set a good example for those who may be watching and listening to me. What about you? Have you ever run with a pace group? How Do I Know If I’m Ready To Train For A Marathon?